Sony, for a couple of years, was my very favorite smartphone manufacturer. The Z3 was, in my opinion, the best smartphone of its generation. I have since moved on to a Nexus 6P, but my wife still uses my old Z3 and I still miss its epic battery life and water resistance. The Japanese manufacturer has hit a bit of a rough patch the last couple of years, but they are still cranking out phones, and I'd wager some of you readers are still on team Sony, lusting after their hardware. If that's the case, then you really should check out the sale going on over at Amazon today. 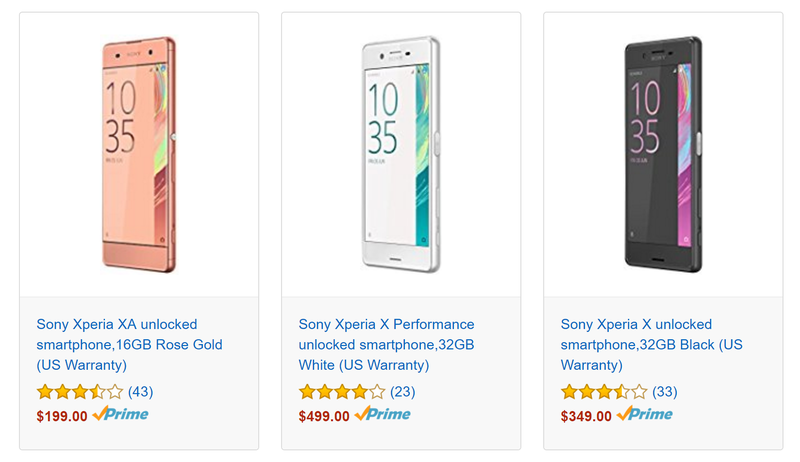 As part of its daily Gold Box promotion, Amazon has discounted all colors of the Sony Xperia XA, X, and X Performance by 25%. That translates to $199 for the Xperia XA, $349 for the Xperia X, and $499 for the X Performance. Sure, they may just be clearing out inventory for the newer XZ, and X compact, but a deal's a deal, eh? These are easily the best prices that I've seen yet for the Sony handsets and beat the deal we posted a few days back for the Xperia X by a fair margin. Want an unlocked Sony Xperia? Now is a good time to buy one — grab one for yourself by following the links below. The sale expires at the end of the day, so don't procrastinate.